As the weather gets colder around the country, our appetites naturally increase compared to the summer months. 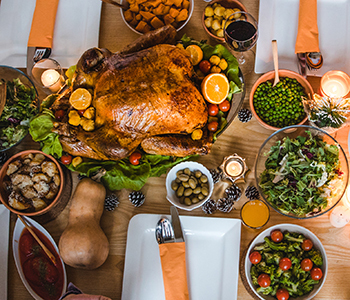 Pair a natural desire for more food with the abundance of food at holiday parties and Thanksgiving dinner and it’s no wonder the average person gains 5-7 pounds over the winter. Here are some tips and recipes to keep your holidays in check so you can avoid the scale shock. Have a small snack or a full meal before the party. Eat a healthy meal or snack that contains protein (chicken, eggs, jerky, beans, nuts) to prevent hunger and overeating. Drink water before and during the party. This will help decrease hunger and keep you hydrated if you are drinking alcohol. Socialize away from the food. People who stand by food while they’re socializing tend to eat mindlessly. Find a spot where you’re away from the tempting treats and can focus on interacting with friends and family. Eat some vegetables. If you’re not sure what the host is serving, bring a salad or the green bean recipe below to ensure you have a healthy vegetable option. The fiber and nutrients will help you feel fuller with little calories! Look at all the options before loading up your plate. This will keep you from putting food on your plate you don’t really want, so you can focus on your favorite foods. Use a smaller plate, and only fill it up once. This will force you to choose the foods you really want and keep you from overindulging or getting lost in all the options. Slow down! Eat slowly and savor each bite. Desserts options are usually endless after Thanksgiving dinner. Allow yourself to have your top two favorites, but make sure you eat slowly and savor or else you won’t be satisfied and you’ll be reaching for seconds and thirds. Don’t overdo the leftovers. Finding ways to reuse the turkey and vegetables is a great idea. But if you are going to be tempted by all the leftover pies and cookies, you’re better off throwing them out. Plan for a family walk after dinner, or maybe a tag football game. Being active after eating will help control your blood sugar and may keep you from overeating. Check in with your hunger. If you ate so much you’re not hungry the following morning, it’s okay to skip breakfast or have a light option, like some yogurt or an apple with almond butter. Keep it simple and light to help balance out the indulgences from the previous night. Place cauliflower florets and garlic in a steamer basket over boiling water, cover and steam until very tender, 12 to 15 minutes. Place the cooked cauliflower and garlic in a food processor. Add buttermilk, 3 teaspoons olive oil, salt and pepper; pulse several times, then process until smooth and creamy. Transfer to a serving bowl. Drizzle with the remaining 2 teaspoons oil and garnish with chives, if desired. Blanch green beans in a large stock pot of well salted boiling water until bright green in color and tender crisp, roughly 2 minutes. Drain and shock in a bowl of ice water to stop from cooking. Heat a large heavy skillet over medium heat. Add the oil and the butter. Add the garlic and red pepper flakes and sauté until fragrant, about 30 seconds. Add the beans and continue to sauté until coated in the butter and heated through, about 5 minutes. Clean out the turkey cavity. Chop 1 carrot, 2 stalks of celery, and 1 onion into cubes. Salt and pepper the turkey cavity, and stuff with cubed veggies, 2 sprigs of rosemary, 6 sprigs of thyme, and salt and pepper. Tie the legs together, and tuck the wing tips. Rub the entire turkey with 1/2 cup of extra virgin olive oil (may not need all oil). Sprinkle turkey with salt, pepper, and dried thyme. Place turkey breast side up on a roasting rack. Cook for 3-4 hours or until internal temperature reaches 180-185 degrees in the thigh or 170-175 degrees in the breast. Remove vegetables from the cavity. Let stand turkey stand for 20 minutes before carving.